09.18.33, there appears an apparent stroke of luck the exploration of the golden tablet. Lots of happiness on all sides. 09.19.33, to Shiraz. The tablets were deposited at a safe in a branch of the Imperial Bank (I.B.P.) under the name of Herzfeld. In August of 1933, the workers at the excavation site were on strike because their wages were continuously decreasing with the drop in the value of the U.S. dollar. I was forced to let many of them go. There was a strained atmosphere at the terrace of Persepolis. Discovery of the first two foundation tablets on September 18 was not only an archaeological sensation, but also a considerable cash value. The news of the finding spread like the wind. How could I keep the gold, silver, myself, and most importantly, the 2500-years-old Achaemenid inscriptions safe until morning time when we could safely deliver them to the Imperial Bank at Shiraz? I put them under the mattress on my cot and laid down in full gear -- holding my hunting rifle on my chest with my faithful dog Toi sleeping bound to the post of the cot. I could hardly sleep – laying 10 cm above these 2500-years-old documents which I had carried out a few hours ago into the daylight and which were probably last touched 2500-years-ago by Darius, the Great King, the King of Kings, the King of the Lands, with his own hands. In 1933, Krefter discovered Apadana’s gold and silver foundation tablets which claimed Darius the Great as the founder. This discovery was first reported in Persepolis – Reconstructions at pages 52and 53. 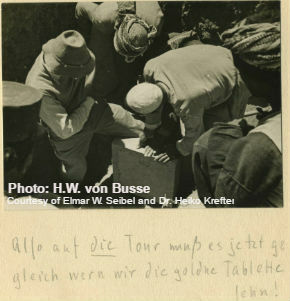 In March 1931, before the start of the excavation, Herzfeld and Krefter inspected the ruins in order to plan the order of the procedure. During the inspection, they noticed square-shaped holes that were 35 cm long in the axis of the western wall of the Apadana and vertically cut in the rock. One of them was found on the intersection of the north and west walls. Krefter guessed it was preparations for a deposit, but Herzfeld believed it was an unfinished hole for the sewer. 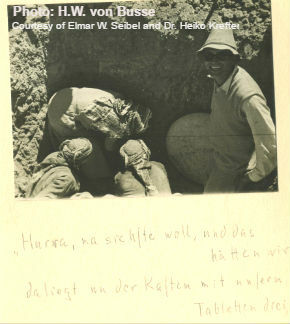 Two and a half years later, Herzfeld sent a telegraph to Krefter from Chicago asking him to do small sample excavations. In the morning of September 18, 1933, Krefter cut a hole 1.2 by 1.2 m around the cross point of the eastern and northern walls of Apadana until he reached a mud brick wall that was 1.61 m from the foundation. At the 1 m depth, he reached a stone block (Schmidt Fig. 43A). After removing the stone block, he found the damaged cover of a stone box. Upon removing the cover, he found a black metal plate. Under the black plate, Krefter found the gold foundation tablet that shone as if brand new. After turning over the black plate, he realized he was holding the silver foundation tablet that had tarnished over time. In the fundament, under the stone box, he found some pieces of amber, four golden Croesids, and two silver Greek coins. The next morning, the incredible findings were taken to the Imperial Bank of Persia in Shiraz. After Krefter’s original guess about the holes were verified with the discovery of the deposit, he excavated the southeast corner on September 20 and found similar findings. In his diary, using the old German blackletter handwriting “Sütterlin,” he writes about the adventureous circumstances surrounding the safety of the tablets until they could be delivered to the bank the following day. Krefter’s diary will be published in parts on our website for the first time. 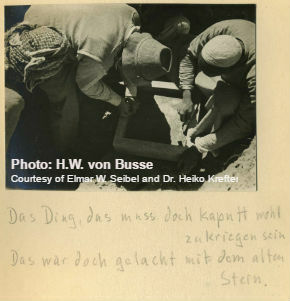 A German colleague of Krefter’s took this photograph which was part of a collection in an album with his satirical descriptions.